BYOD (Bring your own device) is becoming the norm in many companies as more and more people use smartphones, tablets and other flexible devices for office use. IT departments are hence facing a situation of how to manage data access via these devices that are not owned by the company and make a lot of company information vulnerable to leaking and other compromises when BYOD is implemented. You don’t hide your head in the sand, do you? Samsung in this respect introduced SAFE (Samsung Approved for Enterprises) to enable CIOs and IT personnel manage this situation better. 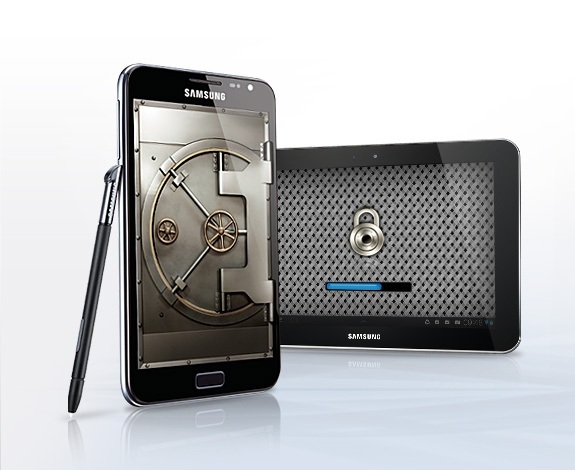 Samsung launched SAFE yesterday at Gartner Expo ITXpo in Europe and this will also see a global roll-out soon. SAFE will make the average Android device meet security standards with Samsung’s strict and comprehensive standards, irrespective of OS fragmentation. SAFE approved applications will assist in management of corporate data and email, on-device encryption, virtual private networks and mobile device management to industry security standards. SAFE Platform: SAFE smartphones and tablets provide stronger security on the device level to corporate employees using IT policy management through Microsoft Exchange ActiveSync (EAS) and on device encryption (ODE). In addition, it provides the most extensive Software Development Kit (SDK) to Solution Partners, which allows them to develop differentiated solutions on Samsung devices. This security-oriented SDK support applies to horizontal and various vertical solutions. SAFE Partner Program: The Solution Partners can provide solutions supporting various features such as VPN and MDM using Samsung’s B2B platform. Industry-leading VPN and MDM solution vendors are already developing solutions based on Samsung smartphones and tablets. Samsung is collaborating with its Solution Partners by providing the most extensive SDK as well as up-close technical support. SAFE Quality Assurance: Many corporations find it difficult to select the right mobile devices for business, because they worry whether these devices – and the software solutions that work on them – have the right set of security features. Samsung provides in-house reviews of Partner’s solutions based on SAFE Program standards. That helps corporate IT departments to easily select devices that meet the reliability standards established by Samsung. Samsung will continue to expand the number of solutions reviewed for the SAFE Program (Samsung does not provide liability or guarantees regarding the functionality or performance of Partner’s solutions, but reviews whether the solutions meet Samsung’s security standards).